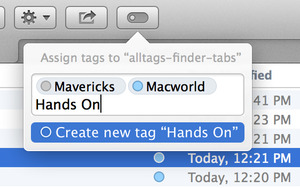 Mavericks’s Finder tags feature offers a number of benefits over the older file and folder labels, but one of the drawbacks of tags is that items are no longer colored with your preferred tag (nee label) color—you see just a tiny, colored dot next to the file name. The reason for this is clear: While you could apply only a single label to a file or folder in OS X 10.8 and earlier, you can apply multiple tags to files, so OS X wouldn’t know which of those tags to use for the item color. Still, I really miss the colored folders of old, as I used those colors as quick-glance “Hey, this is [important/finished/etc. ]” indicators. I’ve been able to restore an approximation of this feature using Erica Sadun’s $3 Folderol, which makes it quick and easy to colorize the icon of any folder. Launch Folderol, and its window offers a row of default folder colors; click one to chose that color, or click the swatch to the right to choose any custom color using the OS X color picker. Whichever you do, your chosen color appears in the large drag-and-drop area above. Drag one or more folders into that area, and Folderol instantly gives each folder the appropriate colored-folder icon. Alternatively, you can easily apply both a custom image and a custom color to a folder—say, an image of a large exclamation point combined with a bright-red tint—by first dragging the image into the Custom Image well. You then choose your color and drag the folder to be modified. A nifty option (Folderol > Tint And Tag) lets you colorize folders and apply Finder tags at the same time. With this option enabled, you type a tag name in the Tag field before dragging your folder into the Folderol window; alternatively, you can leave the Tag field blank to automatically tag the folder with its color name (for example, Red). However, I couldn’t get Folderol to use existing Finder tags—if I typed “Highest” into the Tag field, whenever I used Folderol to tint and tag a folder, the resulting Finder tag was Highest*. 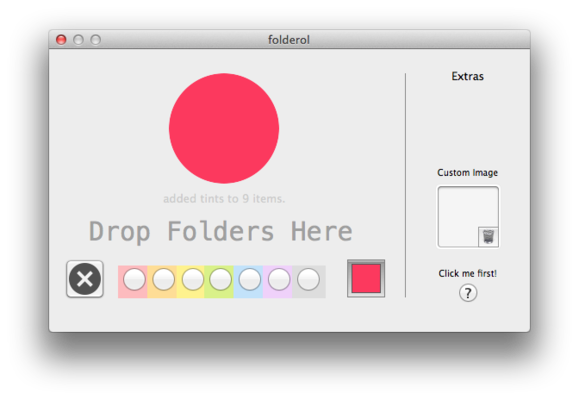 By default, Folderol lets you modify only folders. However, if you choose Folderol > Folders Only to uncheck that option, you can modify file (though not application) icons, as well. You can remove a Folderol-applied colored folder by clicking the no-color (x) button and then dragging a colorized file or folder into the Folderol window again; alternatively, you can use the Finder’s Get Info command (File > Get Info) on the folder, select the folder’s icon in the Info window, and press Delete. Now for the caveats: Folderol doesn’t highlight the entire icon and name with your chosen color, as OS X 10.8 and earlier did with labels—it just colors the folder. It also feels like a bit of a kludge: If you have Finder aliases, you have to use Folderol on the original items, not the aliases; Folderol changes the modification date of any folder you use it on; and if a folder has a custom icon, Folderol completely replaces that icon with a colored-folder icon. Finally, it would be nice if there was a way to automatically sync Folderol colors with Finder tags so, for example, you could sort Finder windows by Folderol colors. But despite these limitations, for those of us who have long used Finder-label colors as visual cues in the Finder, Folderol is a big improvement over the tiny circles of tags. This review is part of Macworld’s GemFest 2014. Every weekday from July until September, the Macworld staff will use the Mac Gems blog to briefly cover a standout free, low-cost, or great-value program. You can view a list of this year’s apps, updated daily, on our handy GemFest chart, and you can visit the Mac Gems homepage for past Mac Gems reviews. Want to stay up to date with the latest Gems? You can follow Mac Gems on Twitter or on App.net. You can also subscribe to the Mac Gems RSS feed.